The fight both sides have been spoiling for just occurred around a creek called Bull Run near Manassas Junction, Virginia. Confederate commander, General Pierre Gustave Toutant Beauregard, the hero of Fort Sumter, had previously withdrawn his forces to take positions behind Bull Run. Such must have seemed to Union commander, General Irvin McDowell, as weakness, because he advanced in Beauregard’s wake. Beauregard planned to draw McDowell into crossing Bull Run and attacking him near his center, allowing The Confederates to flank the Yankees around their left flank, thus cutting off McDowell’s escape route to Washington and his means of supply. McDowell did not take Beauregard’s bait, but instead, attempted a flanking maneuver of his own around Beauregard’s weakly defended left flank, where Beauregard had positioned Colonel Nathan G. Evans’ 4th South Carolina Regiment supported only by two cannons and Major Chatham Roberdeau Wheat’s Tigers, the 1st Special Infantry Battalion, Louisiana Volunteers, which consisted mainly of rogues and ruffians of ill repute, many culled directly from New Orleans’ jails. All total, only about 1,100 men held the Confederate left and would ultimately face at least three divisions. The battle opened with Federal cannon fire from near the center of the line. This was but a distraction, as McDowell was actually busy moving the bulk of his army around the Confederate left flank. 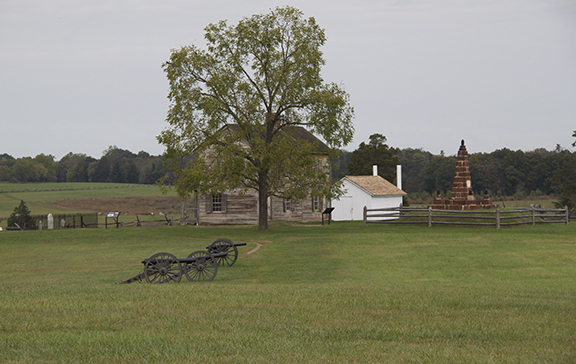 Dust raised by their movement and observations from Confederates in a high tower exposed the maneuver, and General Evans positioned his regiment to the left to meet the threat. A brief skirmish between some troops from South Carolina and Wheat’s Tigers ensued as a result of mistaken identity. Officers from both units quickly sorted out the mess but not before the Tigers suffered 3 killed and several wounded. Soon Yankees were pouring over Bull Run to be met by the men from South Carolina and Louisiana. Standing firm, the Confederates beat back the Yankee advance and even charged into their midst. Some of Wheat’s Tigers threw down their slow-firing muskets and, with screaming Rebel yells and drawn knives, gallantly fell upon the hapless Federals, throwing them into confusion and driving them back. But they soon recovered and added more units to their number. Badly outnumbered and with their units mixed, Evans and Wheat were forced to withdraw back to Henry House Hill, where they were eventually joined by fresh Confederate brigades rushed into the battle. Included was the Virginia Brigade, commanded by General Thomas J. Jackson, who stood firm against the charging Yankees like a stonewall. As a result, his brigade is now being called the “Stonewall Brigade” and its commander “Stonewall” Jackson. With more Confederate brigades thrown into the action, the Federals began to falter and withdrew in a panic, skedaddling all the way back to Washington, leaving the battlefield to the victorious southern warriors. Sadly, during the fight at Henry House, Major Wheat was badly wounded and carried from the field by some of his men. This evening, he was told by the surgeon there was no record of any who had ever survived such a wound as his. To which he defiantly replied, “I don’t feel like dying yet. I shall put my case on record!” No doubt he will. Though a great southern victory, special recognition must be given to Wheat’s Tigers, who held the line, withstanding many times their number, allowing time for a defense to be organized, ultimately guaranteeing victory. There are clearly no better fighters than the Tigers from Louisiana. Reassured, Bee rejoined his shattered force and asked his Alabamans to make another effort. 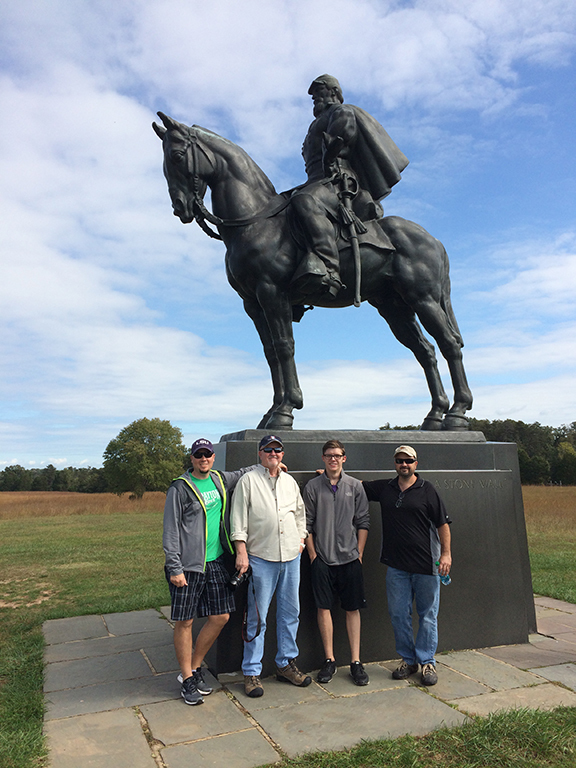 We visited the battlefield for First Manassas and took the walking tour. Very interesting to see the ground I wrote about in An Eternity of Four Years. Things were actually closer together than I had imagined. The first image is of Henry House and the Federal gun line mentioned in the book. Evans and Wheat were driven back here from in the distance in the left. The Confederates, by then, had realized the battle was on their left flank and began rushing brigades to that area. This hill became the focus of the fight. Confederate positions are about 800-900 yards in the direction the guns are facing. We also visited some Second Manassas sites, a battle not really mentioned in the book, because Ethan was in Richmond tending to Aimee when it occurred. The Louisiana Tigers played a very remembered role in this fight. 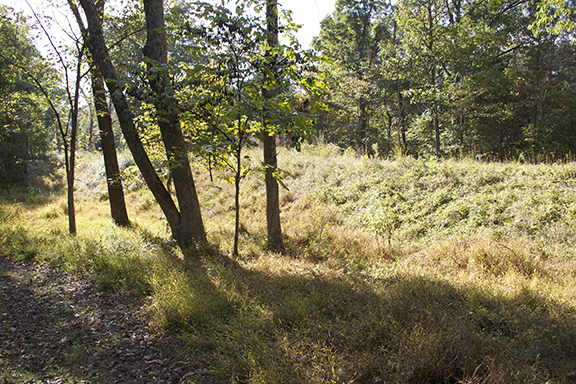 The Confederates were deployed in very strong positions along an unfinished railroad cut. In some places the railroad was a trench, while in others it was elevated. The image below is of an elevated section held by the 1st Louisiana Brigade. They ran out of ammunition and were reduced to throwing rocks at the Yankees 20 feet away just on the other side of the cut and eventually driving them off. Went to dinner tonight at BJ’s Brew Pub and managed to get there and back without getting lost. Our navigation skills are getting better….